You will find all of the amenities and services to make your stay in Moscow as relaxing and convenient as possible. Serving lunch, dinner and appetizers with full bar service. Additionally, we offer a special menu every Sunday from 10am-2pm with a wide selection of breakfast and lunch menu items to choose from. Be sure to join us on Thursdays for Trivia Nights! $3 Bud Light, Coors Light or Kokanee Drafts, House Wine, or Well Drinks. 1/2 Price appetizers available as well! Monday-Friday 6-9 a.m. Saturday and Sunday 6 -10 a.m.
Connect to our high-speed wireless network throughout the hotel. Beautifully landscaped and the perfect place for BBQs, socials, receptions or any outdoor event. Contact our Catering Department to schedule your next event. Available for hotel guests on a 24-hour basis for word processing, Internet access and e-mail with access to a color-laser printer. Copy service also available through our front desk. Features an indoor pool, sauna, hot tub and wading pool. The adjacent fitness center offers a selection of exercise equipment. All with a fabulous view of our outdoor courtyard. Overlooking our indoor pool and beautiful outdoor courtyard, our fitness center will help you enjoy your workout. With 12,000 sq. 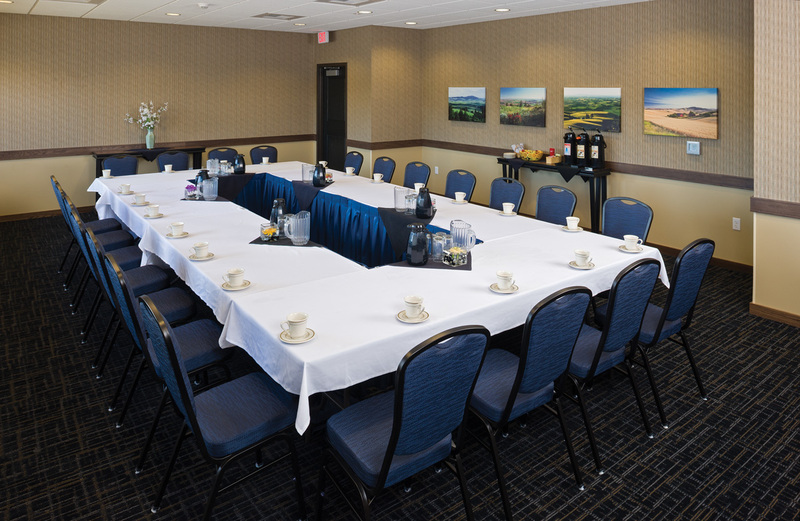 ft. of meeting space and full catering services, we are the perfect place to host your event. For additional information on our facilities, please visit the Meeting Facilities page. Your four-legged friends are invited to come along! Please let us know they are accompanying you so we can provide a pet-friendly room for you. We do have a $30 per day pet fee (maximum of $150 per week). Complimentary shuttle service is available for guests arriving at the Pullman-Moscow Airport. Shuttle services are also available to the Spokane airport. Please contact us for details. Indulge your sweet tooth and enjoy a delicious cookie, served nightly at the front desk. Our well-lit parking lot is available for you to park with additional space available in adjacent lots for larger vehicles. Whether you’re driving or flying, find us easily. Take I-90 heading east towards Spokane. Take the second exit (Highway 195) to Colfax / Pullman. Stay on 195 through Colfax (follow signage to Pullman). Approximately 14 miles past Colfax, turn left on the Pullman turnoff (Highway 270). Follow the signage to Moscow as posted through Pullman. We are located on Highway 8, which connects Moscow and Pullman. Take Highway 95 north towards Moscow. Continue into Moscow following signage to Coeur d’Alene. Turn left onto Third Street. We are located on the right side of the road at the corner of Third Street/Moscow-Pullman Highway and Farm Road (approximately 2 miles after turning onto Third Street). Served by Horizon Airlines with convenient daily flights to Seattle and Boise. Horizon Air offers connecting flights with Northwest and Alaska. Please contact individual carriers for flight information. Rental cars are available at the terminal. Complimentary transportation is available from the Pullman/Moscow Airport. Located in Lewiston, Idaho, 30-minutes south of Moscow-Pullman. Served by SkyWest with connecting flights to Salt Lake City. Rental cars are available at the terminal. Located 90-minutes northwest of Moscow-Pullman. Served by Alaska, America West, Delta/Skywest, Frontier, Horizon, Southwest, Northwest and United. Please contact individual carriers for flight information. Rental cars are available at the terminal. Serves the communities with scheduled routes between Moscow/Pullman and Spokane Airport. Charters are available for groups of any size to Lewiston and Spokane. Call for reservations.